Besides doing the photography project at the ‘drop in’ centre in Pondi, i also join the volunteers on trips to the slums or the garbage dump. Especially the last one made an impact on me. A place full of dirt, diseases, sadness but also laughter. It’s a whole different world out there. This community of gypsies and migrants have their own routine and ways of keeping themselves alive. The photography project with KALKI was featured in the local newspaper! During a fieldtrip we were noticed by a journalist from the Dinakaran Daily. The photography project is a big success and i’m very happy that i could help to get KALKI some publicity! The people from KALKI are wonderful big hearted people with never ending energy and a passion when it comes to creating a happier and better life for the streetkids of pondicherry. 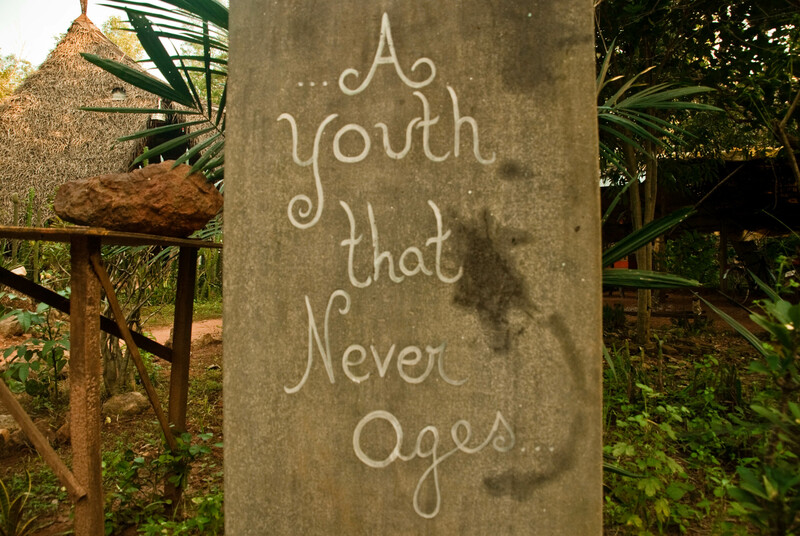 In reflection on last weekend’s activities and festivities, we have often spoken of what it means to be a child, a youth, a young “adult” in Auroville- where life is free and limitations of most kinds are seemingly nonexistent or arbitrary at best. In a place where “merry Christmas” was thrown around as often as “Sri Aurobindo” might have been on any other day- it was strange (or maybe perfectly correct) that the celebrations in order had nothing to do with “Christ” or religion. In a gift economy, the holiday presents were more like tokens of appreciation where “purchases” take place as a collective contribution to the community; take something give something. Saturday, during day one of the Youth Center Christmas festival we waded through a sea of aloe-vera-green face painted, happily half-clothed and flower-crowned children. They traipsed around, holding fistfuls of fake money to fund their endeavors of game challenges and bodily adornment. 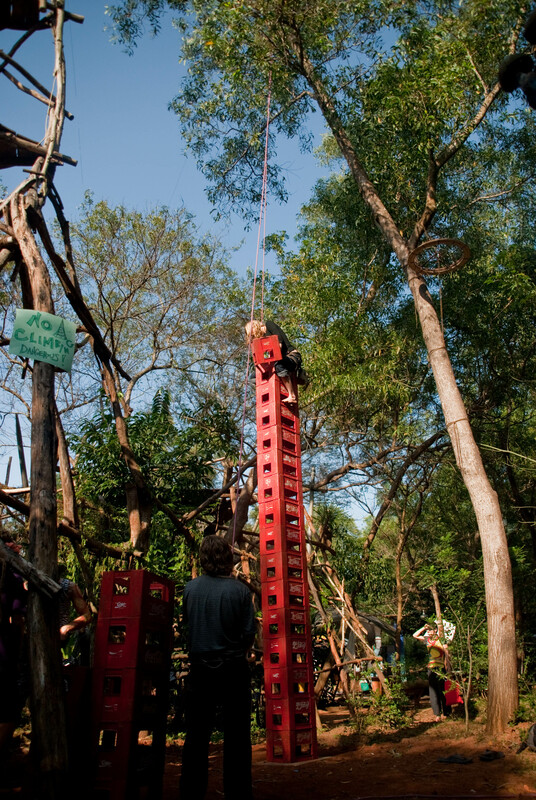 The landscape at Youth Camp is very much like jumping face-first into a scene out of Peter Pan, the Lost Boys have taken over this section of Auroville, and tree forts and ziplines abound. This mystical playground landscape perpetuates the surrealistic feeling most of us have had since arriving to it’s extreme. The festival was much more of a communal celebration of a large-scale familial unity rather than a specific holiday-oriented and consumer-based fete many of us would be used to. Entering the space as a tourist, at home among the many other Canons and Nikons, I felt slightly invasive and more like a critical zoo-goer than a welcome participant. Fortunately, Aurovillians don’t care too much to question the place of others so long as you blend yourself in with the celebratory craziness. I happily received a better understanding of being raised as a true Aurovillian wild-child. All products of liberated and free-spirited parents, they exist with the whole world as a playground- an understanding which certainly allows them to be perhaps the most truthful representations of themselves, unfiltered. In fact, “youth” is not reserved for the young here. As is understood in the practices preached in Auroville, all of life is a learning process and youth has nothing to do with age. In a sense, all Aurovillians are wild children and unapologetically unfiltered. The trouble is, with no defining lines the progression to a participatory adult member provides a very difficult transition for those who are so comfortable in their naked/painted existence. We’ve encountered many people with Western educations and understandings who continue to valorize more highly a society which makes more aggressive attempts at seeking human unity. We are left, as traditional University students, to wonder at the way we’re so desperate for a necessitated paper-proof of our educational achievements (Auroville doesn’t give diplomas). American teenage-rebellion dreams of breaking free from our chains. In the “Land of the Free”, most of my youth was (and continues to be) spent questioning systems of power and authority and dreaming up the many ways in which I could subvert and destroy them. From a pseudo-anarchistic standpoint, I fascinated myself with idealizations of living unrestricted and untraceable. Here, where that lifestyle exists as some degree of a reality, I have become mildly disenchanted by my own passions in that way. I have found that, as always, a compromising balance of the in-between might be best. There is a stark and frightening contrast between the impoverished lives of the surrounding children who struggle just for access to education and basic human necessities like food and water and the children who are raised with the planet as their playground; a belief in human unity unfortunately doesn’t negate social difference. In speaking with one employee of an after-school care program for what is an amalgamation of Aurovillian children and Tamil children (kids from the local villages), I received a melancholic explanation of the desperate happiness of the village children at simply having paper to draw on as compared to a certain sense of entitlement that was representative of the children who had been raised in Auroville. A belief that the world exists as a ball in the palms of their tiny hands, the ideas of Western society and cultural practices far removed from their everyday lives. 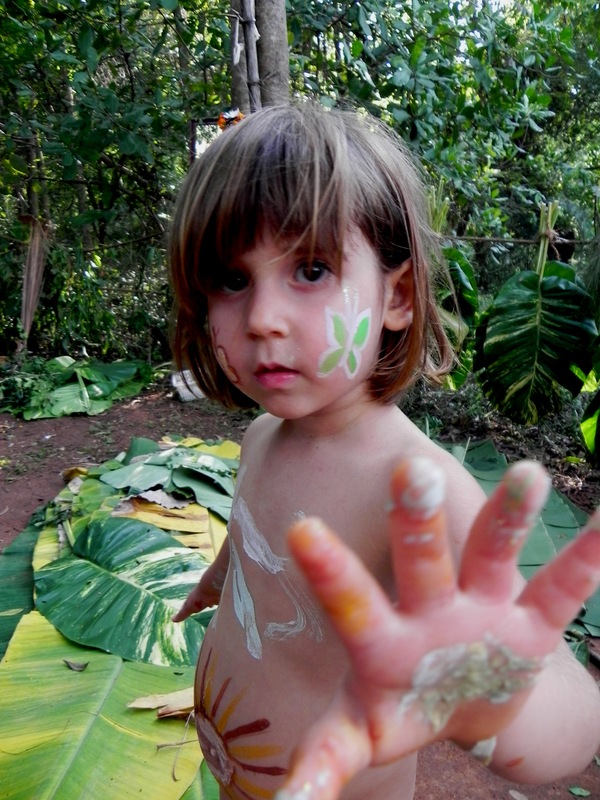 They are raised to feel like anything is possible, but also relatively unknowing perhaps of what exists outside of their community which is in many ways shut off from the non-idealistic practices of outside-Auroville spaces. Additionally, the way that the Auroville economic system works provides that there is virtually no posssibility for “escape”. No one here earns money, so no one can save money. Children who grow up here don’t technically have access to funds, which means no plane tickets out. In truth, Young Aurovillianhood is a lifelong existence, one of a committed lifestyle to a place that is both a fairytale and as I have read somewhere “the silicon valley of social entrepreneurship”. For the moment, I am happy to soak up the positive ideals and massive social change being approached, while I still remain critical about whether or not I could hack it as an Aurovillian Wild Child. Every season my Mom loves to decorate and there is always a dominant feature in her décor. In the fall there are pumpkins, Spring there are bunnies etc. I usually give her a count when she’s finished, “Mom, do you realize there are 73 snowmen in our house… and we live in California?” This winter is a little different though, I have taken to counting cows. 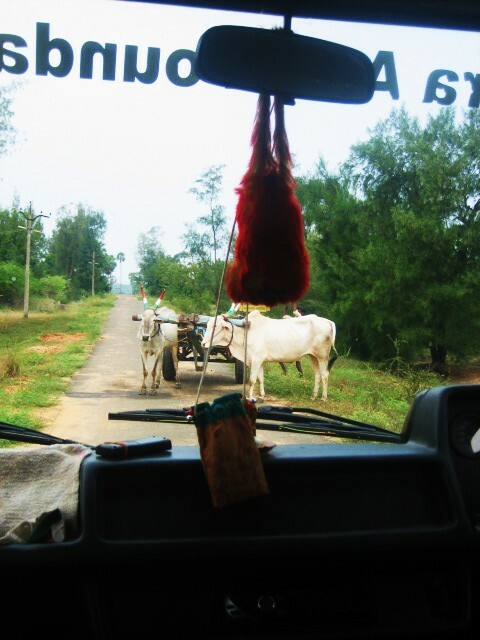 The term “free range” has brought on a whole new meaning in India, especially when it comes to the cows. They own the road, wandering where they please, eating whatever grass or trash they prefer on the way. They have a royal air and a look of utter ambivalence towards you. My favorite way to watch the cows has been in the bus, where I am not the one responsible for dodging them. I am already feeling a little nostalgic for our spine jarring, repellant sharing, music filled rides. I often find myself deep in thought or keenly observant while looking out of a car window. Reflections have been torrential as we have had so many inspiring presentations. Themes for me have been spirituality, practical sustainable living, the meaning of education and empowerment, the human race having a twenty year expiration date according to Dave the forestry guy. Watch the following video as if you were on our bus and see what comes to mind. You can feeel it….It’s ELECTRIC! Below is a short interview with Akash of EV Future, a local Auroville company that produces the most incredible clean energy, sustainable, and stylish electric scooters! I’ve been speeding down Indian dirt roads on my Ninja Turtle green Humvee for the past week now. It is without a doubt the epitome of cool. I can’t think of a better marriage between sustainability and sheer awesomeness. Not only does it reduce air and noise pollution, it handles smoothly, it flies like a bullet, and it ups any rider’s street cred. It’s because of these combined features that I refuse to switch to a petrol-powered vehicle. In order to ignite a culture shift towards sustainable vehicles, we need to have our cake and eat it too. I doubt the masses would sacrifice power and speed for sustainability alone. We have to reinvent our modern technologies to function on renewable energy but without losing any of the comforts or practicalities we’ve grown accustomed to. Otherwise, we can forget about the masses adapting. Akash and Sukrit and the other clever people at EV Future realize this and are developing their vehicles accordingly. 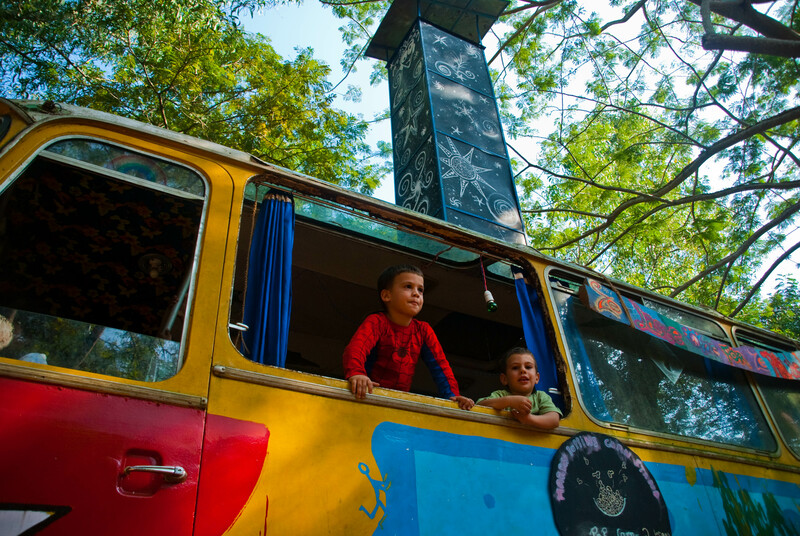 But on the other side of the equation, at least locally, remains Auroville itself. The city could encourage greater and faster adoption of electric vehicles by providing powering stations everywhere (currently, there’s only one that EV Future erected themselves). 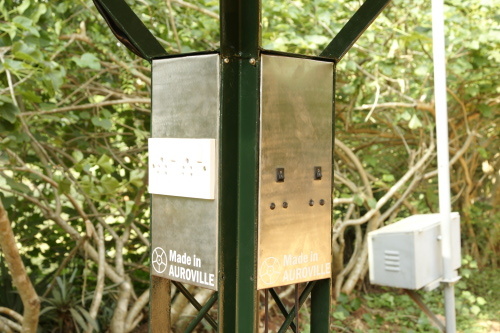 Auroville could also embark on a concerted effort to make some roads petrol-free. If other global cities can become more bike friendly, why not make Auroville and elsewhere more electric vehicle friendly? 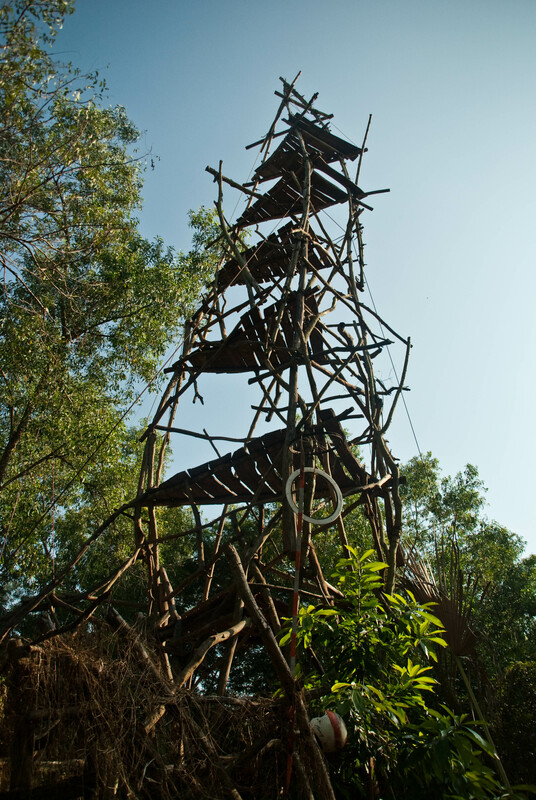 Two weeks in Auroville, and two weeks to go. We’ve all decided on multimedia projects and are most of us are already ensconced in our respective organizations, designing websites, logos, brochures and videos. Since I’m a carpetbagger from the MPPA program and am virtually incompetent with Adobe design programs and video cameras (or regular cameras, for that matter), I’ve decided to assemble fifty “press kits” and write a profile for online publication on my selected 10-to-5 home for the next two weeks: ADECOM Network, based in Pondicherry. We visited ADECOM (which stands for Animation, Development, Employment and Communication) as a group during our first week, and the organization impressed me immediately: Founded in 1992, it trains and supports community-based organizations and civil-society institutions to advocate for the rights of the historically marginalized Dalit people (also known as the Untouchables), particularly women and children, in Tamil Nadu. Dalit people exist outside the four-tiered Hindu caste system (they are, literally, “outcasts”) and constitute 25 percent of the Indian population (compared with 3.5 percent Brahman, the priestly—and highest—caste; 5.5 percent Kshatriya, the warrior caste; 6 percent Vaishya, the traders; and 52 percent Shudra, the “service” caste). Caste-based discrimination was outlawed in India in 1954, but needless to say, the system is still de facto intact—according to ADECOM, most Dalit people live below the poverty line, earning approximately 60 rupees (one Euro) per day on average; most are agricultural workers but don’t own land; and political repression is widespread. The Indian government has, of course, instituted affirmative-action programs to improve the social mobility of the Dalit people and ensure their political representation and access to higher education—the problem is, most of the measures only apply to practicing Hindus. ADECOM is working specifically to pressure state and federal governments to include Dalit Buddhists in political-representation requirements; reduce political interference in local elections, the first of which were held in Pondicherry Union Territory in 2006; and increase the political voice of Dalit women, many of whom are still at the mercy of the extant patriarchal system. Dominant (read: male) caste-based political forces do not tolerate female political participation and women are threatened with physical abuse and even death to exclude them from the process. Obviously, ADECOM’s aims are commendable ones, and I’m thrilled to be working here. My fellow volunteer, Jenn, and I have had to adjust to a very steep learning curve, however. They’re turning in a grant application to the UN Democracy Fund on the 31st, and I’ve been putting it together for them, to the extent that I haven’t even had time to commence my “actual project” yet. I’m interviewing the managing trustee, Lalidamballe Perumal, on Tuesday, though, and we’ve already got lots of great photos, so I think we’re fairly “on track.” The days are long, but we’re busy, and the food is delicious—yesterday’s menu included chapattis and the best vegetable korma I’ve ever tasted. And, of course, I’m learning a lot, which is, of course, the most important thing :-). P.S. If I have time, I’ll be editing ADECOM’s weblog. Check it out.